End Boss Games’ Chicken Escape is an adorable puzzle game that cleverly combines a Pacman-esque style of play with color matching. Help Chicken, a lost hen trying to get back to her eggs and chicks, by moving and matching colored road tiles to guide her back home. This iPhone game is easy to master but with over sixty levels and four modes of play Chicken Escape is challenging enough to keep gamers hooked. Chicken is constantly on the move so it’s up to you to keep up with her as you tap to rotate and swipe to move the road tiles on the map to create a path home for her. Each level opens up with an objective requiring the player to score a certain number of tile combos before they can move on to the next level. To satisfy the objective, match two tiles or more of the same color to create combos for Chicken to walk across. If Chicken hits a dead end, you lose those combos so make sure she keeps moving. Once you’ve scored the requisite number of combos, a hen house will drop onto the screen and you must guide Chicken to the house to finish the level. As you move through the levels, obstacles and prizes will pop up on the road to make things more interesting. 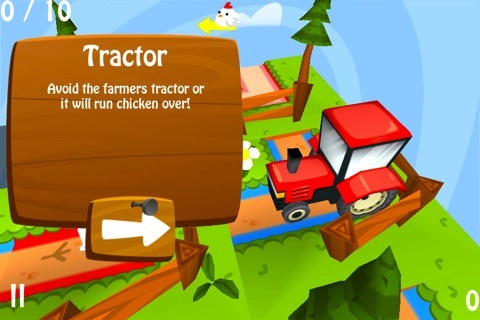 Keep an eye out for the tractor in particular: you lose the level if Chicken gets run over. Walking over worms will enable a Super Chicken transformation, able to defeat nearly everything in your path. There are four modes that you can play in: Arcade, Time Attack, Rescue, Endurance. In Rescue, walk over eggs and chicks to save them before the clock runs out. Cute country music accompanies you in your quest to get Chicken home. The graphics and art are even cuter. Game play is very smooth and responsive…sometimes too responsive. One too many times did I accidentally flip a tile around too many times, resulting in Chicken walking into a wall. (But this might be a result of getting too excited while playing the game and accidentally tapping an extra time in my haste to keep her moving.) Chicken Escape is a fun game with tons of replay value that kept me busy for quite a while. I was pleasantly surprised by how much I enjoyed the game. Although the game looked interesting from the screenshots I was skeptical about how much of a challenge the game offered. Chicken Escape did not disappoint and players will definitely get their money’s worth from this game. 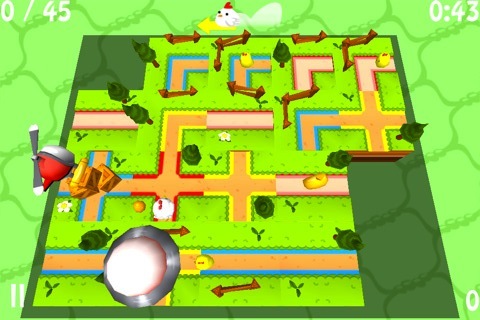 AppSafari review of Chicken Escape was written by Julie Guan on March 5th, 2011 and categorized under App Store, Arcade, Board, Fun, Games, Puzzler, Strategy. Page viewed 4660 times, 4 so far today. Need help on using these apps? Please read the Help Page.